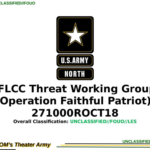 A presentation from U.S. Army North on Operation Faithful Patriot from October 2018. 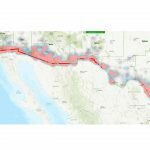 A map of U.S. Border Patrol “tactical infrastructure” including vehicle and pedestrian fencing as of FY2017. A spreadsheet listing U.S. Border Patrol nationwide apprehensions by citizenship and sector in FY2018TD through October. The data includes deportable aliens only.